Barack Obama owes me a pen knife, and owes you one too. If there is one Bush legacy that I hope can leave the USA in January, it’s our State of Fear. In fact, when I went to hear Senator Obama at the Nutter Center back in February, he talked about not being afraid anymore. This was after the TSA took my little Swiss Army pen knife at the door.The one with a blade shorter than the keys on my key chain. After 6 years with Special Forces- I can tell you, I could do more damage with a sharpened key, a knitting needle, or even a ballpoint pen (all allowed on a plane) than that little pen knife. Sure I understand that this is the future President of the United States, but, for the most powerful man in the world, with a bevy of trained Secret Service people around him to be afraid of me with a 1.5″ blade makes me wonder if we’ve got anyone with a brain at the top. So, he also owes me a better explanation of why he declined public financing. What, is he really afraid that his message of “Change” and “Hope” can only win with a fat bankroll? Is John McCain and his “Straight talk Express” really that formidable as an opponent? John McCain should be as scary as that pocketknife. Then, we’ve got a flip-flop on FISA. Now it’s OK to spy on the people who’ve put our “trust in God” as it says on the money we use- but, only if the US Government and the telecommunications companies can listen in. Don’t get me wrong, I still think Barack Obama is the best possible choice (now that Gravel and Kucinich got sent packing), and I believe that we can do much to mend fences across the globe with a black (but not too black) man with a Muslim name running the country. But, I just wish we’d have a man with a spine. Shouldn’t be afraid of pen knives, elderly x-POW’s or the Telecommunications industry or especially, the people of your own country. The real enemy is fear, and I fear most that Senator Obama has lost touch with the true fears of my fellow citizens- that we’ll lose our jobs, our homes, our access to health care or that Wall Street has gambled away our country’s wealth, while George Bush was busy- taking away my pocket knife. I won’t be at Stivers tomorrow to hear Senator Obama, not until I get my pocket knife back. Previous Post: Pay to have lunch with me and learn something too? I can’t say I care and see no reason why public financing is somehow morally superior to hundreds of thousands of small donors. Can’t say I have really ever agreed with you on anything until now…not that I don’t enjoy reading your posts, we are just on different ends of the political spectrum. I was a Marine Infantryman for 9 years and it never ceases to amaze me how “crazy” people get when they see a knife, no matter how small the blade. As far as Obama’s flip-flops, I hope he keeps them coming…not that McCain excites me but he’ll get my vote over the knife thief. Good luck getting your knife back man…I have a few spares if you need one. Americans are slaves to their own fears, and the powers that be exploit them to the hilt, and even create new fears. It’s the same old story that has gone on for century after century. Those who live in fear, do not get the pleasure of living in this life. PS – If you want to hear what Obama has to say, go to C-SPAN. They say the same damn thing on every stump speech in every city anyway. It’s called show business. You might be able to replace your pen knife the next time you go to a presidential event. After the event all the collected knives are placed on a table near the exit for their owners to retreive. Since many don’t get claimed there are always a few left after everyone is gone. I was one of the last leaving a Kerry appearance in Springfield and picked up a nice 10 tool SAK. Maybe its yours? I asked about that- The TSA said no, they were put in the trash. Sounds like its time for dumpster diving! BTW when did TSA replace the Secret Service? Good question as to when the TSA replaced the Secret Service for security of venues. I’d rather we got serious about what constitutes a real threat to our county- a penknife with a 1.5″ blade- or Enron/Countrywide Executives who rob us blind and then get off with a pat on the back. Aren’t they both the same. I don’t want to lose my $40 pocketknife. That’s stealing from me. If the TSA cannot show the same courtesy and return the items after the event then bureaucracy wins over logic again. It is the same with policies that allow corporations to profit immorally unpunished. They are the same thing. If we can’t find leaders that can get the bureacracy to think logically without establishing benefits unevenly for a special interest here and a special interest there then we are doomed. Government cannot force bad busines plans to flourish. They need to provide the policies that permit private entrepreuneurs to engage their ideas and make a good profit. The free market should take care of most of the ceo shortcomings however there needs to be some consumer protections. The Enron/Countrywide guys did wrong. But only after capitalizing on some bad policies put in place by bureacrats. I went for Barack at first due to his charm and feel good speech. But like you said, if you look past the rethoric, what’s behind it? I later found out about Ron Paul. He doesn’t sweet talk or pander, and back up everything he says and does with consistent voting records. Curious what your view is on RP, please share. I have no problems with Ron Paul- except he isn’t electable. He’s naive on foreign policy too- but, when it comes to the current race- Ron Paul is a non-entity. Wait you expected a half-black, muslim sounding named candidate during war time to have a backbone?? I have been saying this for awhile but Barack Obama’s first term as president is going to be worse than Bill Clinton’s, which wasn’t very pretty (failed health care plan, don’t ask don’t tell, NAFTA…etc). That is what happens when you have no real ideology. The whole Democratic party suffers from this. My guess is the Elephants are back in power in 2010 with a vengence! I was amazed, flew back from JFK to London Heathrow on Thursday night…. WITH my full size swiss army pocket knife in my bag! Security apparently missed it, i was so scared i realised it was in there when i was in line. The girl at checkin didnt ask any of the usual thigns like have you got any sharp objects, nothing to jog my memory. I’m usually so careful. So i dumped my bag on the scanner and was ready to ask if there was anything i could do to not lose it, and they didnt even take a look at my bag, it just went on through like all the others. They check our sheos, make us take off our jackets and belts, and yet they missed my pocket knife with a 2 and a half” blade. It remained in my bag in the overhead locker the entire flight, but if i got through, just think what someone else could have got through with! And the damage they could have caused. 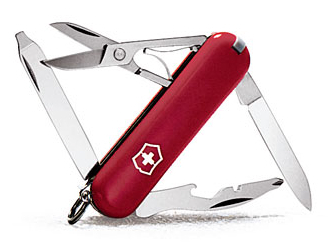 I had the same Little Swiss Army Knife as it’s called – lost at the Miami airport in April. It was a “no-no” as the screener said. Is it even possible to hi-jack a plane in the US any more with everyone convinced that it’ll be flown into a building? I daily, literally daily, missed this knife. Just got a new one today finally. Thanks for the common sense. without him our country may fall…..
Bush was a piker when it comes to spying on the populace.